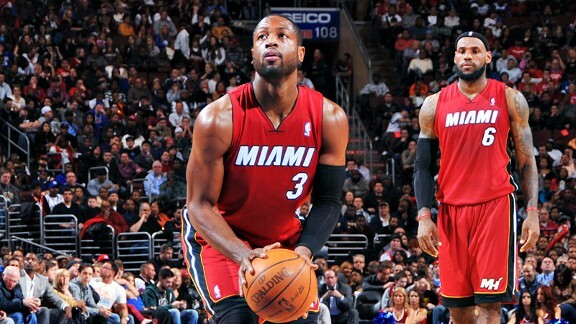 LeBron James now gives Dwyane Wade some advice before every free throw shot. MIAMI -- Dwyane Wade's number is 45 and LeBron James won't let him forget it. As a friendly reminder, LeBron yells the number at him every time Wade steps to the free throw line. "45! ... 45! ... 45!" No, this isn't the number everyone associates with Wade -- that would be "three" -- but this is, in fact, Wade's magic number these days. Believe it or not, 45 is the degree angle that gives Wade the best chance at making free throws. So were a handful of reporters standing inside the Heat's practice facility three weeks ago. It was a Friday afternoon in late January and the reporters were waiting for Wade and LeBron to make themselves available for a routine media session. But first, Wade had to finish shooting free throws. Following every shot, a computerized male voice could be heard in the distance reciting a two-digit number. "39 ... 41 ... 40 ..."
What in the world? Everyone's confusion grew deeper. The numbers weren't increasing so we knew it wasn't counting makes or misses. 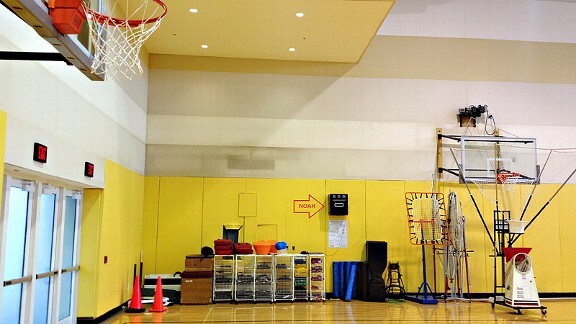 After anxiously peering around the open gym for the source of the mystery voice, we finally found out where it was coming from: a black machine hanging from the wall about 20 feet away from Wade. The black box wasn't the only one blurting out a number; a nearby LeBron was shouting numbers too and it was sending Wade into a fit of laughter. "11! ... 17! ... 12!" What we found out later, after asking some Heat staffers, was that LeBron was teasing Wade. You see, two years ago, the Heat were the first NBA team to purchase and install a toy called "Noah" that tracks the precise arc of a player's shot (get it, Noah's Arc?). The machine instantly lets you know the degree angle of your shot through a built-in audio speaker. There's the machine hanging on the wall across from Wade's free throw basket. Wade, as you might have noticed over the years, has a line-drive free throw arc and LeBron was making sure he knew it during that practice in January. So as Noah shouted out Wade's 39-degree shot arc, LeBron joked that it was closer to 11 degrees. Wade, evidently, got a kick out of it. "45 ... 47 ... 46"
This time, LeBron was silent and there was no laughter. Wade was stone-faced, nailing free throw after free throw. "45 is my number," Wade said after his free throw shooting session. "If I shoot 45, I’m a pretty good free throw shooter." But is that true? Well, Wade started working on stretching his free throw arc with Noah just before that Jan. 20 practice. At that point, he was shooting 71 percent of his free throws, down from his career rate of 77 percent. But since working with Noah? Wade has shot 82 percent from the charity stripe. "That machine is great," Wade said. "It’s great for me and it’s great for other guys to hear when you’re making your shots what number you’re at. You can feel it. I’ve been feeling better at the line because of it." The percentage difference is small enough that the uptick might just be random chance, but Wade thinks there's something to this Noah machine. Just a few weeks ago, he started at 39 and he's now regularly hitting 45. LeBron's number is 44, Wade relayed to the media. "When I miss one," Wade said, "he’ll come up to me and say 'Hey, that wasn’t 45.' Same thing with him. I know what his number is and I know when he’s not doing it." Wade's natural shot doesn't have much arc ("God didn’t give me that ability."). But at 30 years old, he's trying to raise that angle from 39 and maintain his new sweet spot at 45. Next time Wade goes to the free throw line during a game, keep a close eye on LeBron. Chances are you'll catch him doing his best Noah impression. And now you won't be completely confused why he's yelling "45!" in Wade's direction.